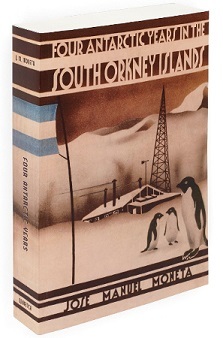 We are delighted to announce the publication of Four Antarctic Years in the South Orkney Islands: an Annotated Translation of ‘Cuatro Años en las Orcadas del Sur’, by José Manuel Moneta. The book is one man’s fascinating record of four winters in the Antarctic during the 1920s, the period of transition from the isolation of the Heroic Age to the beginnings of radio communication with the world outside. José Manuel Moneta’s account was originally written in Spanish and published in twelve editions. This is the first English translation of what is still the only autobiographic account of the South Orkney Islands. R.K. Headland has added copious supplementary material ranging from maps and notes to a bibliography and an index.